It’s been shared nearly 50k times, as of writing this. The second polar bear appears to have just emerged from water (drops coming from its tail?). This can often cause fur to clump (it happens to my dog when he is bathed). Is this causing a lot of the difference? Were the images taken at different times of year? I believe that polar bears hibernate. It could be that the first polar bear has been eating, storing up fat for the winter period, and the second has just left hibernation. Is the image of the same polar bear? I’m fairly confident it isn’t - hence I’ve taken it to be a comparison of the typical bear then and now. I am aware that it may be difficult to find much evidence around these photos. They are, actually, irrelevant to the question as summarized by you on request. The pictures are meant to be illustrative; criticising the second picture for e.g. giving the "wrong" year is attacking a straw man. Due to warming air temperatures, ice-floe breakup in western Hudson Bay is currently occurring three weeks earlier than it did 30 years ago, reducing the duration of the polar bear feeding season. The body condition of polar bears has declined during this period; the average weight of lone (and likely pregnant) female polar bears was approximately 290 kg (640 lb) in 1980 and 230 kg (510 lb) in 2004. Arctic Climate Impact Assessment (2004). Impact of a Warming Arctic: Arctic Impact Climate Assessment: Key Finding 4. Cambridge: Cambridge University Press. ISBN 978-0-521-61778-9. OCLC 56942125..
Stirling, Ian; Derocher, Andrew E. (2007). "Melting under pressure: The real scoop on climate warming and polar bears" (PDF). The Wildlife Professional (published Fall 2007). 1 (3): 24–27, 43. I don't think there is reason to believe that this is offset by an increase of 20% in body weight in other regions (lacking any plausible increase in living conditions). It was not taken 2019, but in 2015. The idea of the "2019" / "2009" given in the picture is not, however, to claim that those were the years in which the pictures were taken. 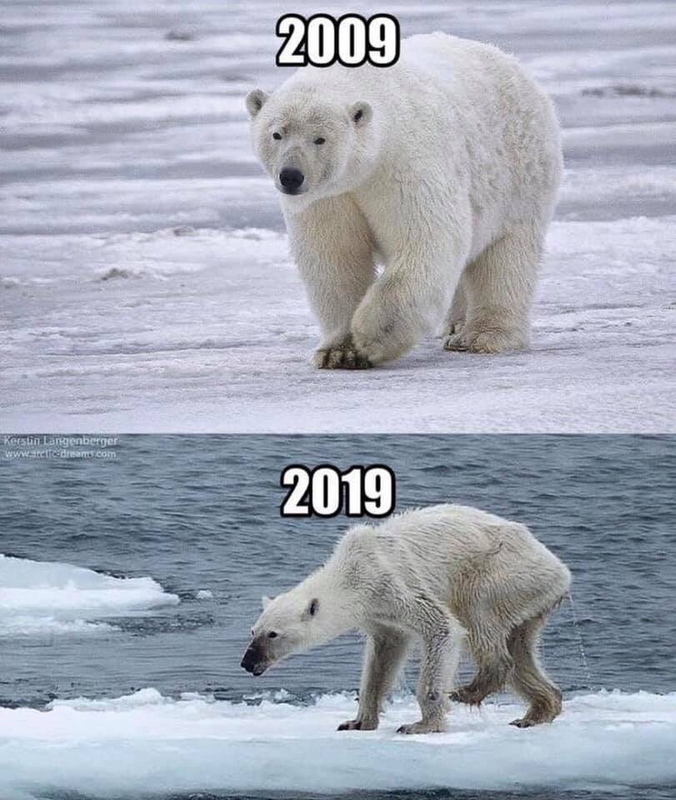 As stated in the FB post ("The 10 years challenge we should really care about..."), the idea was to illustrate the worsening situation of polar bears (and probably climate change in general), *in context of the "10 year challenge". The "2019" is today, the "better" 2009 (to illustrate that the situation is worsening) is just "10 years back from right now". An image search for "wet polar bear" shows a wide range of results, with the specimen pictured under "2019" definitely being on the emaciated side. Yes, wet fur makes a difference -- but not that much. Polar bears are not true hibernators. But even a healthy female bear just out of "hibernation", being wet does not look like the specimen in the "2019" picture. It's nowhere claimed that it's the same bear. The life expectancy of a wild polar bear rarely exceeds 20 years. Not the answer you're looking for? Browse other questions tagged climate-change animal-welfare . Are polar bears doing well despite a reduction in sea ice? Does Susan Crockford have any scientific credentials related to polar bears?